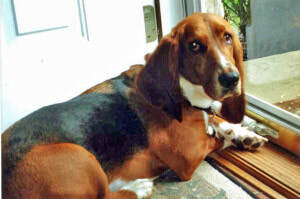 Oscar came to us in June of 2009 after we lost our beloved, Barnie. We weren’t sure if we’d be ready for another dog right away, but the whole in our home and hearts was so big. 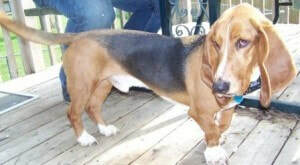 We had found Basset Buddies and had attended Basset Fest, so we started looking on the BBR web site. There were a number of them who appealed to me, but I kept coming back to Oscar. We started the process and the next weekend, we set off for Elk River to meet him. When we talked with Lea on the phone, her best description for Oz was, “he’s just a really good dog.” It was the exact description I used for Barnie. We arrived at Lea’s, Oscar was out in the yard with Lea’s two Bassets. Ron went into the enclosure and sat down on a chair and Oscar ran over to him, put one paw on one shoulder, one on the other and a love story was born. Oscar loved to be hugged or petted or be talked to! He was one of the most affectionate dogs I have ever seen and good-lookin’ to boot. He knew how to sing and had a favorite he liked to sing with his mom and dad, Peaceful, Easy Felling by the Eagles. We’d start and he’d join in. I’m sure the neighbors wondered what was going on! And he knew the difference between songs; he only sang Peaceful, Easy Feeling! I could tell you hours of stories about our little buddy. We sadly lost Oscar this past winter, but his presence is still felt in the house and I think he will always be there. I know he will always be in our hearts. He really was just a really good dog! Love you, little buddy!! !